Nice biography, but I’ve come to expect that from Isaacson having read his books on Steve Jobs, Benjamin Franklin and The Innovators prior to this one – and I can’t pick which one is best. Einstein has been a household name for several generations now but few people really know much about him other than he was a weird math genius. 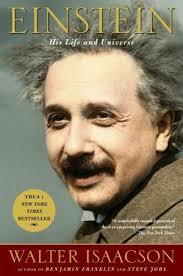 Isaacson shows the deeply human side of Einstein, his ideas, his loves, his friends, hopes, ideals and fears. Einstein was a very creative thinker, he looked at the big picture – the one outside the equations and formulas. As a physicist and philosopher of science he was geared to see how things worked and saw contradictions as well as harmonies starting with the electromagnetic field vs Newtonian mechanics which led to his theory of relativity which precious few people understand but he a applied to the whole universe. He did a few other things, too, written up in over 300 research papers and resulting in the Nobel Prize in Physics (1921). But he had a lot of personal problems. Growing up Jewish in Germany in the last quarter of the 19th century he saw that country go through a whole upset of changes until he had to leave. He had problems with women and commitment. He had problems with the US in terms of security clearances due to rumor and innuendo. He never gave up his belief in God – in some original source that accounted for the complex order in the world. Now I think I’d like to read Isaacson’s biography of Henry Kissinger or someone’s biography of Wittgenstein.